Angophora costata is a common woodland and forest tree of Eastern Australia, and is known by a variety of names including smooth-barked apple, rose gum, rose apple and Sydney red gum. It grows primarily on sandstone soils, usually on headlands, plateaus or other elevated areas. Angophora costata differs from the majority of 'gum trees' in that it is not a true Eucalyptus, but rather a closely related genus. Unlike the majority of eucalypts, whose adult leaves are arranged in an alternate pattern along the stem, angophora leaves are positioned opposite each other. Angophora costata is a large, wide and spreading tree, usually of a height between 15m and 25m. The trunk is often gnarled and crooked with a pink to pale grey, sometimes rusty-stained bark. In nature, the butts of broken limbs form callused bumps on the trunk and add to the gnarled appearance. The old bark is shed in spring in large flakes with the new salmon-pink bark turning pale grey before the next shedding. This image belongs to the travel and nature stock photo library. This stock photo of Sydney Red Gum Forest at Sunset is available for licensing for commercial and editorial uses including websites, blogs, books, magazines, brochures and advertising. Restrictions may apply for images which contain third party copyrighted material or sensitive subjects. Photos of artwork are for editorial use only. 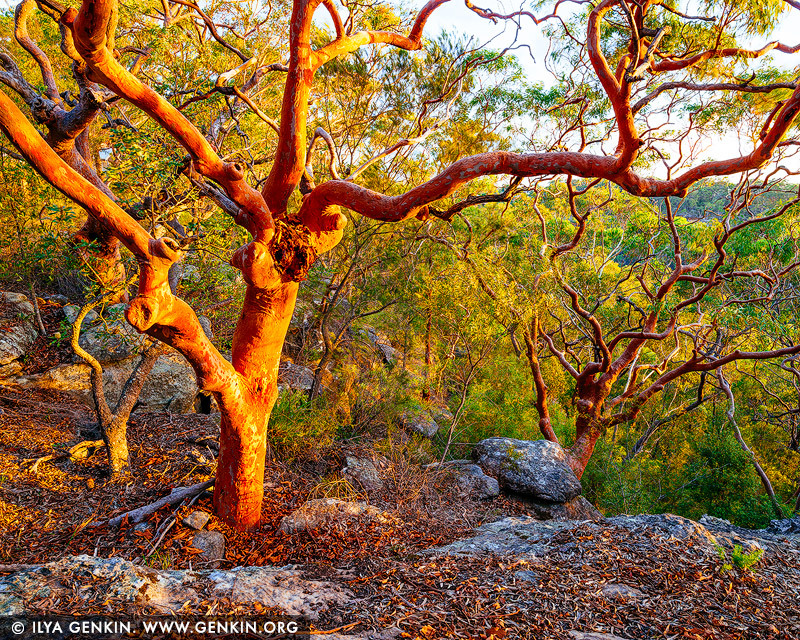 This image id AU-NSW-FOREST-0002 of Sydney Red Gum Forest at Sunset, is copyrighted © by Ilya Genkin. This is not a public domain image.